It would seem modified Polo R WRC Streets are like buses. You wait for ages for one to come along and then two arrive on the scene within two days. The latest super-hot Polo is from MTM, and will appear at the Essen Motor Show in Germany from 30 November to 8 December. Although not as extreme as the B&B car revealed earlier this week, the MTM Polo R WRC Street is still a tasty piece of kit. MTM’s car develops 315bhp – the same as the Polo R WRC rally car – up almost 100bhp over the standard model. A 380bhp version is on the cards, too, which would make it even more powerful than the 362bhp B&B car. MTM hasn’t just concentrated on engine upgrades, though. Like B&B, a four-piston brake upgrade has been fitted to the Essen show car, along with an MTM ‘Cubsport chassis’ with KW shock absorbers. Wheels are 8J x 18” ‘Nardo’ items, wrapped in 215/35 Continental ContiSportContact 5P tyres. 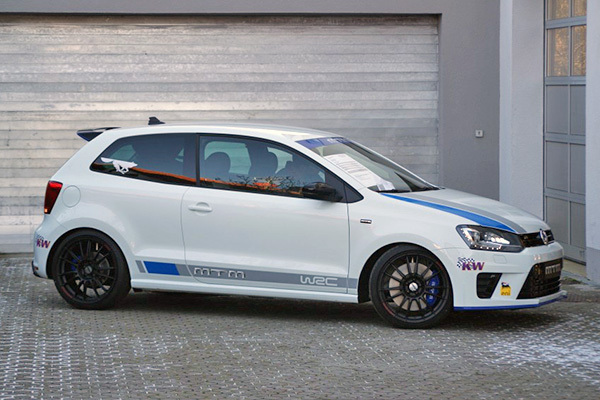 The MTM Polo R WRC Street reaches 62mph (100km/h) in just over four seconds (down from the standard car’s 6.4) and has a top speed of 161mph. No prices have yet been revealed for the cost of the upgrades. If you’re heading for Essen later this week and want to see the MTM Polo, head for the VdAT hall.